Full disclosure - I had no idea there was an upcoming movie when I decided to download the audiobook. I checked this out for one reason, and one reason only...Dan Stevens. I've decided that I will listen to just about anything this man decides to narrate, especially if he has to do the voice of an elderly woman. The story is pretty straight forward. A train car full of seemingly unconnected world travelers find themselves stranded in a snow drift the morning after a rich American is found dead in his cabin, the door locked from inside. 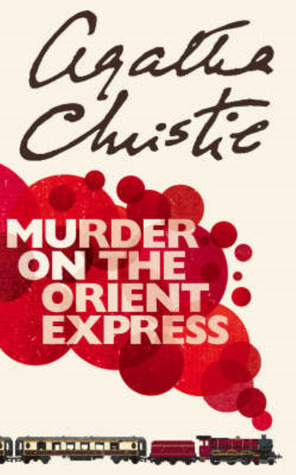 With nothing really nothing else to do until the train starts moving, renowned detective, Hercule Poirot, agrees to investigate the crime and hunt down the likely culprit. The story itself was okay. I like the concept of the glamorous Orient Express and a group of travelers stranded, a murderer among them. The weak spot, for me, was Poirot. He seemed dry, lacking personality, and only around as a means to divulge information. I do realize that this is not his mystery debut, with nine novels preceding this particular story. Perhaps a bit more character development occurs in earlier books, but coming into this one cold, I found him unimpressive. I think I was also expecting a little more tension and suspense. There didn't really seem to be a whole lot of urgency. I never felt the dread that their might be another victim like I did in And Then There Were None. Overall, I highly recommend diving into the mysteries created by Christie. They're fun, even if you're horrible (like I am) at guessing the suspect. I'm tempted to pick up the first Hercule Poirot mystery to see if I get a better feel for the character. That might have to wait though, because I'm still determined to complete my summer reading list. Any other Agatha Christie suggestions? If you want to hear a fun discussion about the mystery genre, be sure to check out our latest #GPLtalk podcast! And in case you haven't seen the trailer for the new movie yet, here you go!